I’ve always said that the bicycle can help solve all the world’s problems, and I stand by it. As I wait for the bike to keep working its magic, it’s good to know that cycling helped save a triathlon friend of mine. Anne Brennan is an Ironman athlete and a fellow blogger….and she’s here to tell you about how cycling helped save her. In 2001, I was running, a lot, too much as it turned out. Running had helped me through so much stress in my life and because we were living in a new country and I was not feeling quite at home, I found myself using my running crutch a lot. Unfortunately I ran so much that I ended up with yet another stress fracture and this time it was a doozey. This stress fracture had been brewing. I had felt it and ignored it. Until one day, as I was running along the Common in Wimbledon, I bounded over a puddle, landed as gracefully as a charging rhinoceros and felt the leg giveway. Within a couple of minutes the knot formed and though I was able to hobble around on it, I knew I was in trouble. When I went to the doctor, he confirmed my fear. The original stress fracture had given way to a crisscrossing fracture and one more run would most likely mean a shattered tibia. So, this mean doctor who took running away from me told me I could swim. I had taken lessons a few years earlier so I knew how to swim and I wasn’t bad at it, but it didn’t give me the release that running did. For three months I swam, patiently waiting for the doctor to give me the okay to run. When I proudly walked back in after three months of doing exactly as I was told, fully expecting that I would be given the okay, I was sadly disappointed. “You can bike,” that stinky doctor said, like he was giving me some sort of gift. I cried all the way home. But the next day I got on the bike and I rode. Luckily, as a runner I had found a new way to explore England. I had created “get lost runs.” I would head in any direction that looked new and exciting and just run. Wherever I ended up I would catch a bus or a train and I would go back home. It made every run an adventure. So I applied the same principle to my first ride. I explored the area around Wimbledon and found myself in a park I had yet to visit – Richmond Park. It was incredible. I couldn’t believe my luck. Within a quarter mile of entering the park I discovered herds and herds of deer. The next day I went a little further, finding yet another park filled with daffodils as far as I could see. I began to fall in love with this new country of mine. Over the next three months I rode all over London and Southwest England. I rode through the hilly Surrey countryside, through city parks and along the Thames path. I invited other moms to ride with me and I made new friends and finally, I began to feel at home. When I went back to the doctor, six months after that horrible puddle-jumping incident I was given the okay to run, with a caveat. I had a history of fractures and the story really was all too easy to read. If I pushed on down the path I had been traveling, eventually running would not be available to me. At another time in history, I would have been gutted by this caveat. Running had been everything to me. 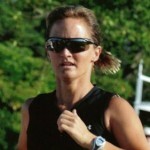 I defined myself in two ways, as a mother and as a runner. But now, with the gift of cycling that the doctor had given me, I knew I would be okay. The truth is, I would have missed my rides if I had gone back to running exclusively. With those three months, I was saved. I had not only been returned to running by allowing myself to heal, I had found a new love in cycling. Today, I still run. I also swim when the training-need arises. But cycling takes an equal part to running. I love my bike. I love my weekend rides with my husband and my solitary exploration rides in our new home in Maryland. In the end, cycling saved me. Ann Brennan is an Ironman triathlete and fitness writer, dedicated to motivating others to get up off the couch and lead healthy lifestyles. Read more by Ann at http://www.annsrunningcommentary.com or visit her YouTube Channel at http://www.youtube.com/user/BrennanAnnie/featured. AMAZING! Love the story, love the inspiration, love that I have a new #RockStar to follow! Yeah, Joel….Ann is definitely a Rockstar. Glad you enjoyed her story. Kudos to Ann! Such an inspiration! Thanks so much. It was just nice to have something good come from that injury. Thanks Sarah. Since then I have moved back to the States and gotten so lucky with our new community. We have a huge cycling club with incredible organized rides almost everyday of the week.